For us the reality of Tasawwuf is only knowledge accompanied with actions . To exceed the limits in grieving is a sin and it is such a sin that is completely without pleasure. Pay attention to Allah, not to worries, they will disappear. Neither consider your worship such as to be proud of, nor consider them useless. If your friends and relatives do not love you, be happy that Allah has removed others from your heart. When Allah is angry, you see a wrong thing as right and wrong superstition appear as facts. Patience becomes easy by crying to Allah, as it removes the pressure. Do Zikr with the intention of developing love of Allah, it will have its effect. We are born for worries, it will end in Paradise, so forget its ending now. Inform the person you have back-bited, after a short while you will stop back-biting. Do not quote somebody without enquiry or research. Hubbe jah (love for fame) and hubbe mal (love for wealth) are grave spiritual evils. They never leave man in peace. When angered by someone, leave his presence or have him removed from your presence and drink cold water. Even if the whole world is covered in sin Taubah wipes it all out Dynamite is small in size but can destroy huge mountains. Associate very little with rulers and those who hold high positions. Stay very far from irreligious people. Do not search for the faults of others. Do not have evil thoughts about anyone. Instead look at your own faults and try to put them in order. You should be particular in offering your salaat in the proper manner, at the proper time with concentration. Always occupy yourself in the remembrance of Allah, either with your heart or tongue. If you experience any satisfaction in taking the name of Allah, then express your gratitude to Allah. Speak in a nice, humble way. Set aside specific times for all your different tasks and abide strictly to these times. Consider whatever regret, sorrow or loss you may experience to be from Allah. Do not think about worldly matters, calculations, profits and losses, etc. all the time. Instead think about Allah. As far as possible, try to help and benefit others irrespective of whether it be in worldly or Deeni matters. Do not eat and drink too little to the extent that you become weak and fall ill.
You should not eat and drink too much to the extent, you feel lazy in carrying out the different acts of Ibaadah. Do not have any desire or greed for anything except Allah. Do not allow your mind to wander towards any place, thinking that you will be able to benefit or profit from there. The tricks of the nafs are extremely subtle. Man sees deception of his nafs only after great difficulty. Deeds are rewards themselves, so why do you ask for reward on rewards. To gain the love of Allah, join the company of the Saints (Ahlullah). Hidden etiquette is to be with Allah, all your time,events and dealings. Ask every one to say a word of prayer for you.You do not know on whose tongue is acceptance. In the company of saints (Ahlullah) atleast you begin to notice your mistakes and sins. Constancy in zikr even without pleasure results in a closeness with Allah and the heart being wholesome. If someone is hurrying along the road, do not stop him for hand-shaking. When going to meet a person, do not sit with him so long as to inconvenience him. While eating do not mention such things that nauseates or disgusts others. Nowadays people are terrified by islah (self-reformatiom). Keeping contact with the pious rectifies a persons Deen. Appreciate,value and remember the Deeni favours which your parents have bestowed to you. If sometimes parents act unjustly, bear their injustice with patience. One can only regard oneself to be insignificant if the respect, honor and love of seniors are embedded in the heart. Disrespect is more harmful than sinning. Juniors should at all times keep in mind the seniority of elders.Do not regard yourself equal to elders. Never give a verdict in a dispute after having heard the story of only one side. Do not raise your voice above the voices of your parents. The companionship of a pious man will induce piety in you. Do not in jest point a sharp instrument to anyone. Be restless in your quest for Allah. Be grateful for the favors that are bestowed upon you irrespective of whether they are plenty or few. Do not be depressed with poverty and destitution. Overlook the faults and mistakes of those who are under your control. If you learn of any fault of someone, conceal it. Be in the service of guests, travelers, strangers, Ulama, and pious servants of Allah. Choose the company of the pious. Fear Allah all the time. Set aside a certain time daily, wherein you should think about all your actions for that day. When you remember any good action done, express gratitude.When you remember any evil action,repent. Don’t ever speak a lie. Live with bashfulness, modesty and forbearance. Don’t ever attend gatherings that are contrary to the Shariah. Continue making Dua to Allah to keep you steadfast on the straight path. To be proud of a blessing is pride but to consider it a gift from Allah & keep in mind your incompetence is thankfulness. Pride develops in some Muslims; they pray and hate those who don’t and consider them inferior. Sins are very dangerous and must be avoided. Do not merely acquire a Fatwa (ruling) to substantiate one’s own views. 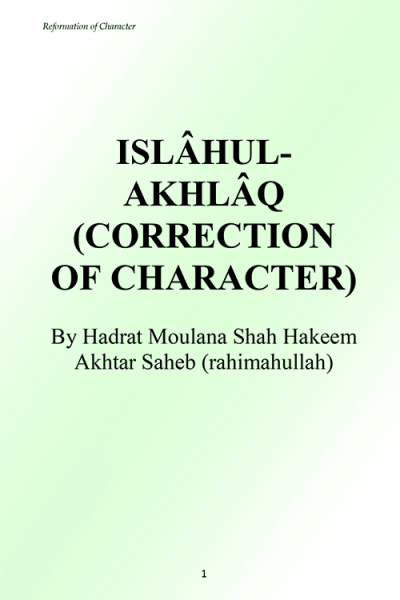 During school holidays, children should be left in the companionship of Ahlullaah (saintly persons). Do not assume that children will automatically acquire manners when they grow up. When meeting someone with whom you have no informal association, do not ask him personal questions. Do not crack such jokes which are hurting to others nor speak in a way which embarrasses people. When a child is obstinate in demanding a thing, do not fulfill its demand. Only the followers of the Sunnah will be safe from Dajjal’s trap. The companionship of an evil man will induce evil in you. When entering the private room of parents, seek their permission before entering. If for some reason you are constrained to leave while others are still eating, excuse yourself. Superstition is a kind of shirk. Abstain from this. Some people never bother to visit the sick. This is not correct. There is great reward in visiting the sick. There is greater reward for granting a loan than for giving charity. 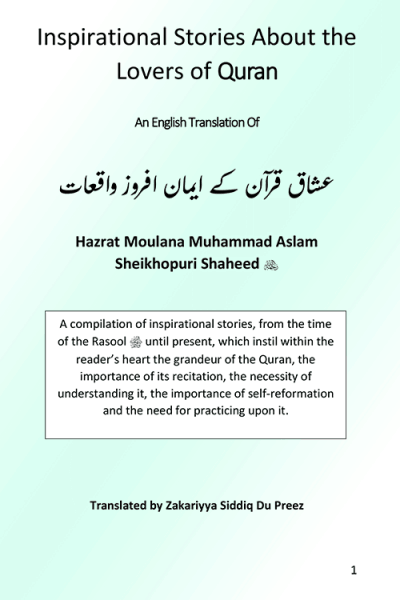 The act of postponing a loan repayment when one is by the means to repay is an act of zulm (injustice). Do not use the articles of others without their permission. Safeguard and treat with care an object which you have borrowed. Do not make promises in haste. Fulfil a promise made. Do not act in conflict with a promise without any valid reason. After your parents’ death make it a habit, to make Dua-e-Maghfirat for them. Do not read the letters of others. If a letter is not intended for you, do not read it. When your child has wronged someone, do not side with your child especially in his presence. If any children come to you for education, do not take service from them. Be watchful of your children’s behavior towards servants and the children of servants. A gift should not be refused because of its small value or quantity. A gift tendered with the motive to obtain some benefit in lieu, is in fact bribery. It is not hadyah. Dua is not sufficient for Islaah (spiritual reformation). One has to adopt the ways and means too. Do not curse or speak ill of time (the age). Time is blameless. Where the company consists of three persons, two should not speak by whispering to each other. Do not waste the time of a busy person by prolonging the conversation by small talk. Do not use extravagant titles or flattery when writing. 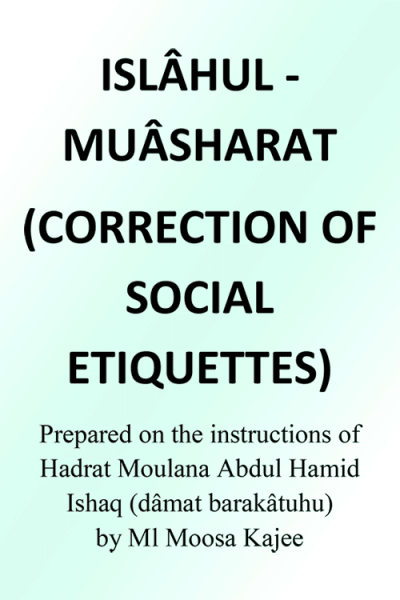 Shariat is Aqaaid (beliefs), A’maal (good deeds) ,Muamalaat (transactions), Akhlaaq (character) & Muasharat (conduct). Disrespect is the effect of pride and arrogance. Do not ask a need from such a person who you know feels obligated to comply even though he may not be disposed to assist. If you have been told to come at a certain time (ie. an appointment), then be there at the appointed time. Do not express yourself in the presence of the sick or his family, in a manner which makes them lose hope in life. Acquire knowledge of Deen according to your needs; either by asking the Ulama or by reading a book. If you commit any sin, repent immediately. Do not hold back in fulfilling anyone’s right. Do not cause anyone physical or verbal harm. Do not speak ill of anyone. Do not have any love for wealth, nor any desire for name and fame. Do not concern yourself with extravagant food and clothing. If someone rebukes you for your mistake or error, do not try to justify your action. Do not laugh excessively nor talk excessively. Do not go about repeating or mentioning an argument that may have taken place between two persons. Always be mindful of the rules of Shariah in everything you do. Do not display laziness in executing any act of Ibaadah. Try and spend most of your time in seclusion. If you have to meet and converse with others, meet them with humility and do not display your greatness.